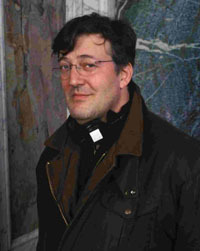 In the United Kingdom, Stephen Fry is seen as a veritable renaissance man -- a successful actor, comedian, novelist, playwright, and columnist. Best known for his appearances on television and in films, he is tall and large, funny-faced, and openly gay. In America, Fry is best known as Jeeves from his 1990s sitcom version of P. G. Wodehouse's Jeeves and Wooster, which aired in America on PBS. He also played Oscar Wilde in Wilde, and had small roles in Gosford Park and A Civil Action. Sharp-eyed viewers may remember his tiny part in A Fish Called Wanda, or his pivotal turn in V for Vendetta. Fry's father was a physicist and inventor, and his mother and her Jewish family had immigrated to England prior to World War II. In his mid-teens, when he noticed he was drawn to boys instead of girls, Fry started getting into trouble. He was expelled from three schools, and attempted suicide at sixteen. At seventeen, he was found guilty of credit card fraud and spent three months in prison. He studied English at Cambridge, where his classmates included Kenneth Branagh and Emma Thompson. It was she who introduced Fry to his long-time comic partner Hugh Laurie, who was Thompson's boyfriend at the time. With and without Laurie, Fry has been a staple of British television and cinema for decades, dating back to the 1983 Robbie Coltrane sketch comedy show Al Fresco. Fry & Laurie have also appeared in other British shows, including A Bit of Fry & Laurie, Fortysomething, two incarnations of Blackadder, and sundry TV specials and movies. Fry's books include The Stars' Tennis Balls and Rescuing the Spectacled Bear, the taut thriller Revenge, and his autobiography, Moab Is My Washpot. He is the author of the stage play Latin! or Tobacco and Boys, a pedophilia farce which draws protests wherever it is staged. He is also the narrator of the Harry Potter books on tape and Harry Potter video games. Author J. K. Rowling enjoys hearing him read her books, and attended his recording sessions. Interview with John Frame, Queer Radio, 7 February 2001: "It gives me enormous pleasure to know that everyone who says hello to me in the street in England also knows that I'm gay and that I have a gay lover -- and that that doesn't affect their view of me. It makes me very proud of myself, but also of my country and how it's changed, and of how people can accept things that they used not to be able to. And that's a genuine pleasure, no question."